It seems that every now and then (more like too often) some right wing group is able to influence a state to push through some anti-immigrant law or ultra-religious ordinance so that innocent people who are just trying to make a living are discriminated against. This is the case of Louisiana’s recent marriage law. The law was pushed through the Louisiana state legislature with the connivance of a right wing organization called the Louisiana Family Forum. The law states that no undocumented can get married in the State of Louisiana since they do not have U.S. birth certificates or documented legal status in the United States. The law is patently discriminatory because because no other state allows for this, and it means that someone who is undocumented cannot legally marry a U.S. citizen or a legal permanent resident in Louisiana. But it gets worse. Even legal immigrants cannot get married under this law if they cannot produce a U.S. birth certificate or a birth certificate of any kind. The problem is that there are many countries and cultures where a “legal” birth certificate does not exist. Take the case of Out Xanamane. A Lao national born in southern Laos in 1975, his family escaped to the United States and he grew up in this country. He had informally married a lady in a Buddhist ceremony, but their wedding was not registered with the State of Louisiana. When Xanamane became deathly ill, his wife could not put him on her company insurance because they were not “legally married” in Louisiana. Yes, Xanamane is a legal permanent resident of the United States, and yes he was married. But the state did not recognize the marriage, and by its new law they had to get married again. He could not. In Louisiana, the law forbade Xanamane to legally marry because he did not have a birth certificate. 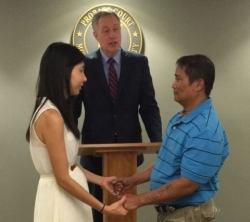 Since Laos’ records are incomplete, and many Lao never received a birth certificate in that country (including Xanamane), Xanamane is barred from getting married in Louisiana. In Louisiana; no U.S. birth certificate and no birth certificate of any kind, no marriage. So the couple had to go to the neighboring state of Alabama to get married. If all of this sounds crazy, it is. As I said there are many countries where people born and raised there simply do not have birth certificates (note: in the case of the Republic of Korea, where my wife was born, Koreans were not issued a birth certificate but were registered on a family register that is different from our concept of birth certificates). They may have other documentation, but not always a birth certificate. In Louisiana this does not seem good enough, and having even refugee status is not good enough either. Like many other states, there are refugees living in Louisiana, and many have no more documentation than Xanamane. What are they supposed to do if they want to get married? Apparently, they will have to go to another state to get married. So Louisiana loses revenue from those wishing to get married in the state. I am also trying to figure out how this law, passed under the influence and support of the Louisiana Family Forum, is pro-family since it is preventing many immigrants from getting married in the first place?